The shipboard drama ended when the hijackers were surrendered to a representative of the Palestine Liberation Organization on Oct. 9, two days after the ship was seized. They were to have been flown to Tunis, but U.S. jets forced the plane down at a NATO air base in Catania, Sicily, and the hijackers were handed over to Italian authorities to be tried for murder, since the ship was in Italian territory at the time the ship was taken. Ah but political winds compounded the issue when Italian Prime Minister Bettino Craxi released the killers. This so enraged public opinion in both the United States and Italy that Craxi was forced to resign after his coalition government fell over the issue. One of the terrorists was captured during the Iraq war in 2003. Most people don’t know that the Achille Lauro had a dark history prior to the Alexandria hijacking, and continued to steam into trouble afterward. She was the kind of vessel sailors sometimes refer to as a jinx ship. The keel of the 631-foot-long liner was laid in 1939 at Flushing, Netherlands, but the ship was not completed until 1947 because of the war. 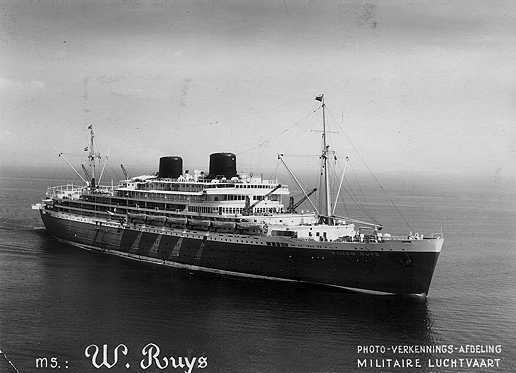 When launched she was put into service by the Royal Rotterdam Lloyd’s service between the Netherlands and Indonesia under the name Willem Ruys. She offered 275 first class cabin beds and 770 tourist class cabins. After Indonesia nationalized Dutch assets in 1956, the ship began around-the-world service from Rotterdam, through the Suez Canal to Australia, and then to Port Everglades, Florida by way of the Panama Canal. The ship’s troubles began after it was sold to the Lauro Lines of Italy in 1964 and given its notorious name, Achille Lauro. This was the name of a former mayor of Naples. The new owners refurbished the ship, added extra accommodations, and planned to put it in service between Europe and Australia. During the renovation, however, an explosion and fire rocked the ship. The renovation was completed, however, and the Achille Lauro entered service on the high seas. The new look did not erase the jinx, however. She was first placed back on the Australian service, steaming from Genoa to Sydney and then to Wellington, New Zealand. On April 28, 1975, the Achille Lauro collided with and sank the Youssef, a 497-ton Lebanese cargo ship off the coast of Turkey. At least one person died in this accident. 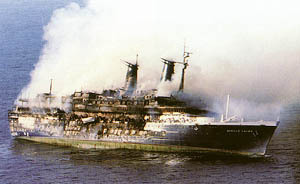 There is a report that the liner suffered yet another fire sometime in 1981. It was repaired but before it was returned to service, the ship was seized by authorities after her owners, the Lauro Line declared bankruptcy. The Lauro Line merged with the Chandris Line in 1985. That was the year the Achille Lauro was seized by hijackers at Alexandria. The fire ravaged the old ship for two days before it listed and sank on Dec. 2.